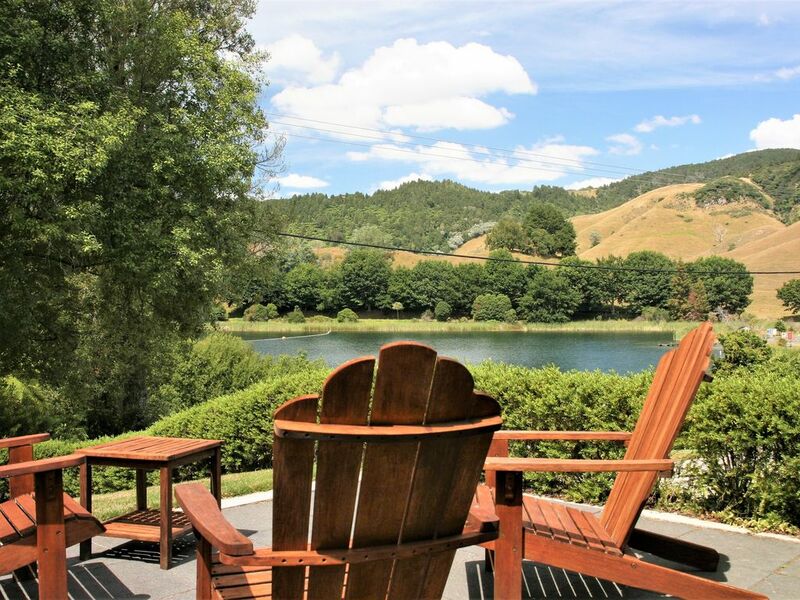 Spring, Summer, Autumn, Winter….Lake View Apartments is the perfect place to relax, unwind and enjoy the views of tranquil Lake Okareka or soak up the last of the sun from the back deck! At the centre of New Zealand's Lakes District, Lake View Apartments is where you can enjoy the lake, walk on the many local walkways, mountain biking just down the road or head into Rotorua for all of the world class attractions! Spacious and modern three bedroom apartment (all bedrooms have balconies with views of lake). One bathroom and 2 separate toilets. Extra large living area…spacious for the entire family with large kitchen! Internal garage for car, bikes and sporting equipment together with a dedicated park for a boat. Plenty of indoor and outdoor space. If you are looking for a “party house” unfortunately this is not the ideal setting for you as we are a family friendly bach!! • Amazing swimming just across the road (30 second walk) or a minute walk to the Lake front jetty/ boat ramp! • Walk around Acacia Bay to the Okareka Walkway! • Walk to the top of Summit Road for amazing views of Lake Okareka and Mount Tarawera! • Horse Riding for more amazing views of Lake Okareka and Lake Tarawera! • Short drive to Blue Lake for a lazy walk around the Lake! • 5 minute drive to Lake Tarawera for lunch or a coffee! • 8 minute drive to Rotorua Town Centre where you have world class mountain biking at the Redwoods or the endless tourist attractions to check out! ...a great place to stay, all year round!!! We are proud to say that we are Bach Donors and support the TimeOut Charitable Trust, connecting our bach with the terminally ill to provide them and their families with a much needed respite holiday during difficult times! A perfect destination all year round!! Perfect family accommodation in a perfect location. All the standard requirements catered for along with extras. Great base for exploring Rotorua district. As usual a great holiday, 4th time at this property. my experience with renting this property was seamless from wo to go and I would definitely return . The house was spotlessly clean . Only suggestion is perhaps more towels - one a piece for a weeks stay not quite adequate. Huge bonus for family groups is the very large living spaces and the bonus of outdoor living opening from both sides of the house perfect. Only time we needed to contact owner was there was no corkscrew and not all wine bottles have screw tops! Great location for the boat racing and the apartment was clean and had everything we needed. Great spot. Clean and tidy place. Close to the lake!